Artist’s depiction of Lisowiciz bojani. The remains of an unusually large Lisowicia bojani specimen were uncovered by paleontologists Tomasz Sulej from the Polish Academy of Sciences and Grzegorz Niedźwiedzki from Uppsala University. The bones were found preserved in siltstone deposits at the Lisowice site in southern Poland. Back in 2008, these researchers started to get an inkling they were dealing with a plus-sized animal after discovering a dicynodont femur bone measuring 56 centimeters (22 inches) in length. This latest skeleton, however, is considerably larger, featuring a femur measuring over 80 centimeters (31 inches) in length. The details of this finding were published today in Science. 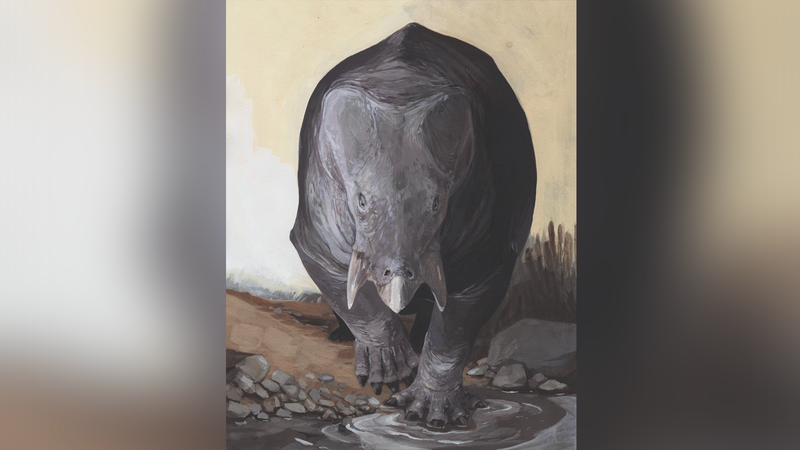 Indeed, the discovery of the elephantine Lisowicia bojani—a four-legged creature weighing an estimated 9 tons (18,000 pounds)— is rewriting evolutionary history. Dinosaurs, this new research suggests, weren’t the only large animals to romp around the Triassic landscape. Comparison of Lisowicia bojani to a modern elephant. Careful analysis of the Lisowicia bojani fossil suggests it stood 2.6 meters tall (8.5 feet) and measured 4.5 meters (14.8 feet) in length. Its weight, at 18,000 pounds, is a bit heavier than modern elephants. Fossils found alongside the dicynodont, such as plants, amphibians, dinosaurs, and other early relatives of mammals, suggests it lived alongside, and possibly consumed, gymnosperm tree-like plants called Brachyphyllum and a seed fern called Lepidopteris. Its landscape was a relatively flat riverside with sparse vegetation. The researchers also found traces of a dinosaur bearing a distinct resemblance to North America’s Coelophysis—a two-meter-long (six-foot) predatory dinosaur. As for the apex predator of this world, that distinction belongs to Smok, a two-legged, 6-meter-long (20-foot-long) carnivore whose name means dragon in Polish. Bones analyzed in the study.